Minnesota's big advantage coming into their series against the Rockets was in the post. Contributor Liam Flynn breaks down how Houston has managed to limit any damage done on the block. This article is a collaboration between Ben and Liam Flynn. Liam is an Australian professional basketball coach currently coaching at German Bundesliga club s.Oliver Würzburg. He has coached in professional leagues in Australia and New Zealand and has been a draft consultant to the Phoenix Suns. For coaching tips and Xs & Os follow him on Twitter @coachliamflynn. Liam will be watching the Rockets closely all playoffs, looking at the adjustments they and their opponents make throughout their series. When the Minnesota Timberwolves drew the #1 seeded Houston Rockets in the first round, there wasn’t much on paper that would seem to tip in their favor. Minnesota was a very good offensive team in the regular season, but the Rockets were better. 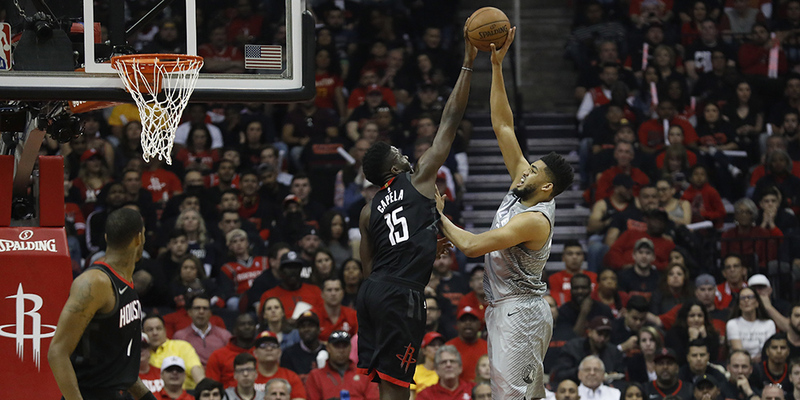 And while Houston boasted a stout defense, the Timberwolves were particularly weak guarding the rim and the three point line — exactly where the Rockets aim to punish opponents. The Wolves are very strong on the offensive glass and drawing fouls; the Rockets’ defensive strengths are on the boards and not fouling. But there was one place that a Minnesota strength matched up against a Houston weakness: the post. During the regular season, the Timberwolves ranked 2nd in the NBA in efficiency out of the post and 3rd in the NBA in the share of their offense that came from the post, according to Synergy Sports. They played with size and strength and bullied opponents on the box. Karl-Anthony Towns led the way, getting over a quarter of his offense out of the post, with the Wolves scoring 104 points per 100 such plays, a very good mark for halfcourt offense. Taj Gibson contributed there too, with 19% of his offense coming on the block and the Wolves scoring an incredible 111 points per 100 plays from his post ups. Andrew Wiggins went to the back down for 11% of his offense, and Minnesota’s results from that were equally good, scoring 108 per 100. The Rockets, meanwhile, employed a scheme heavy on switches, which often left them vulnerable in the post. And the numbers reflected this, as Houston ranked 20th in the league in post defense this season. This, then, was Minnesota’s one big advantage.